Germany not only one of the cheapest study destinations in Europe, but the nation also has an impeccable international reputation. Home to many esteemed universities within the latest QS World University Rankings, Germany offers a growing number of English-taught programs, particularly at postgraduate level. DAAD Scholarships - The German Academic Exchange Service (DAAD) offers many scholarships for international students to study in Germany at various degree levels. Click the link to view the DAAD scholarships database. Erasmus+ - The largest provider of scholarships for study in the EU, Erasmus+ is led by the European Commission, funding international students to study in Europe. It provides grants towards living costs when participating in an exchange program to study in Europe. Einstein International Postdoctoral Fellowship - Fellowship sponsored by the Einstein Foundation for postdoctoral research at a university in Berlin. You can find out more about studying a PhD in Germany here. Heinrich Boell Scholarships for International Students - Scholarships for international students at all levels wishing to study in Germany at an accredited institution. Humboldt Research Fellowships for Postdoctoral Researchers - Postdoctoral scholarships for scientists and scholars of any subject and nationality. Students from developing and emerging countries may be eligible to apply for a Georg Forster Fellowship. Konrad-Adenauer-Stiftung (KAS) Scholarships � Monthly master's and PhD scholarships are available for international applicants under 30 who have completed a university degree in their home country. You'll need to provide evidence of an above-average academic performance, have been actively involved in voluntary work for the benefit of society in your home country, and have an interest in political issues. Kurt Hansen Science Scholarships - Science scholarships to study in Germany, funded by the Bayer Foundation and open to students who are training to become educators in the field of science. Marie Curie International Incoming Fellowships (IIF) for Developing Countries - Postdoctoral research scholarships for international students wishing to study in Germany. Funded by the European Commission. More scholarships for students from developing countries are available here. Mawista Scholarship - Scholarships for those studying abroad while taking care of a child, including those pursuing study in Germany. 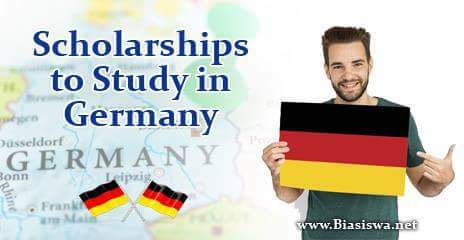 Deutschland Stipendium - Merit-based scholarships of �300 a month are available to highly talented students enrolled at German universities. Nationality and personal income do not affect your chances of being considered. The Helmholtz Association - Annual fellowships are available for doctoral and postdoctoral students from around the world, giving them the opportunity to do paid research at a Helmholtz center in Germany. DRD Scholarships for Sub-Saharan Africans - Merit-based scholarships for students from developing countries in Sub-Saharan Africa pursuing a master's degree in development studies, public administration and development management at Ruhr-University Bochum. Program twinned with UWC in South Africa. Frankfurt School of Finance and Management Doctoral Tuition Waivers - Tuition waiver scholarships for doctoral students studying an English-language program at Frankfurt within finance, accounting, mathematics and business administration. FRIAS Cofund Fellowship Programme for International Researchers - German scholarships for international students to study at Universitat Freiburg on a research-level program. Hamburg University of Applied Sciences Masters Scholarships - Scholarships for international students (for all subjects excluding design, public health and public management) enrolled on a master's program at the university. Heidelberg University - A range of scholarships for international students, such as the Amirana Scholarship for students from developing countries to study medicine or dentistry at the university. HHL International MSc Scholarship for Effective and Responsible Leadership - Scholarship opportunities to study management at master's and PhD levelsat HHL Leipzig Graduate School of Management. Humboldt University International Research Fellowships - Research fellowship opportunities for international students pursuing research in history, anthropology, law, sociology, political science, geography, economics or area studies at Humboldt University. Look out for the latest round of applications here. International Doctoral Positions at Graduate School of East and Southeast European Studies - Scholarships to study at graduate level within Ludwig-Maximilians-Universitat Munich or Universitat Regensburg as a research fellow of East and Southeast European Studies. KAAD Scholarships for Developing Countries - A scheme offering scholarships for international students from developing countries (in Africa, Asia, the Middle East and Latin America) to study at a German university at master's or PhD level. Candidates must possess German-language skills and be of Catholic-Christian denomination. Kofi Annan MBA Scholarships for Developing Country Students - Scholarships for up to five international students from developing countries to study a full-time, one-year MBA at the European School of Management and Technology (ESMT) in Berlin. Other MBA scholarships available at the school include the ESMT Women's Academic Scholarship for female candidates. Max Planck Institute for Chemical Physics of Solids - Post-doctoral fellowships are available to study solid state chemistry at the university. Ulm University Scholarships for International Students - Need-based scholarships for international students nearing graduation at Ulm University. Funding offered for one semester only. Universitat Hamburg Merit Scholarships - Scholarships for all outstanding international students (of all degree levels and subjects) who have been enrolled in their program for at least two semesters. These scholarships also consider applicants' financial need, and you should be prepared to get involved with the internationalization of Universitat Hamburg. RWTH Aachen University scholarships - Funding opportunities for international and home students at RWTH Aachen University.